A mysterious medieval passageway on the riverside next to Paisley Abbey is being opened to the public for the first time this weekend as part of Doors Open Day. Considered one of the town's major historical assets, the earliest parts of the 90m (295ft) long drain are thought to date from the 14th Century. "When you wander around Paisley Abbey there is no evidence of it on the ground," says Bob Will of Guard Archaeology, who is leading the tours this weekend. "Between the abbey and the river it's just a grass park maintained by the council. Trees, flower beds. But if you look closely you will see that there are two or three manholes and they are marking the line of the drain." Through one of those manhole covers, it is a careful climb down a 5m (15ft) ladder before you reach the drain. Although it is narrow, in this particular part of the structure you can stand up, elsewhere it is a crawl space. 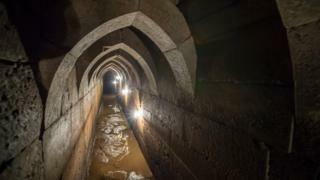 The medieval drain was first discovered in 1879 and then rediscovered in the 1990s. Much of it was silted up, preserving and hiding many treasures, some of which are now on display in the abbey itself. A group of archaeologists spent months sieving through the silt and were rewarded for their efforts. They found a picture of life in the animal bones they discovered, pieces of pottery, lots of plant remains, herbs and spices - some from as far away as the Far East. There was also a medieval love poem as well as lead seals from cloth which showed the abbey imported items from around Europe. "They are stamped with the crest of various towns in France, Germany, London, Italy," explains Mr Will. "It shows you the importance of cloth in the medieval period and how already Paisley was involved in the European cloth trade." There are different kinds of stonework visible on the walls of the drain. Some are from different periods, others show the marks of the individual masons who worked on them - they were paid per piece. Other marks have been interpreted by some as so-called "witches' marks" designed to ward off evil. That, as well as the fact only 90m or so of the passageway is known along with its well-formed structure, has led to some speculation as to whether there was more to the drain than first appeared. "We know it empties out into the White Cart (river) at one end," says Mr Will. "It is then lost as it heads out towards the council building but at that stage it is much smaller. "Certainly if you look at other monasteries, they have a huge drainage systems, maybe not quite as elaborate as the one in Paisley but certainly, probably longer." Image caption Bob Will says there has been lots of interest in visiting the site which he describes as an "architectural gem"
There has been real interest in public access to the drain, with ticket allocation being decided by ballot. It is not surprising perhaps for something that Mr Will describes as an "architectural gem" with much to show. "It wasn't just the abbey standing in isolation," he says. "There was a whole monastery round about it, supporting the abbey. Monks, priests, pilgrims and all the visitors and activities associated with that. "There is so much interest in the drain from the people. Once they know about it, they want to see it."